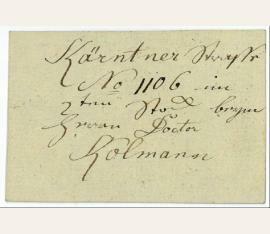 Komponist und Flötist (1770-1836). Eigenh. Namenszug und Notiz (Visitkarte). [Wohl Wien. 1 Kärtchen 82 x 55 mm, beidseitig beschriftet. 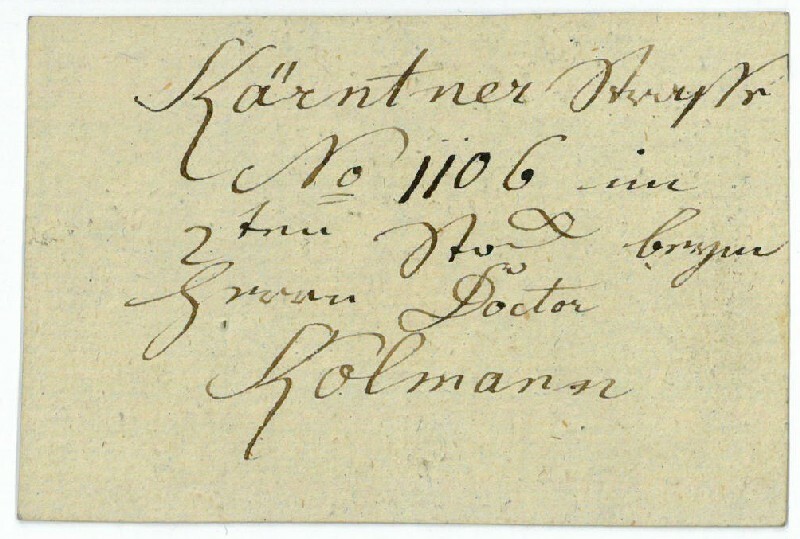 Auf der Vorderseite im dekorativen Rund der Namenszug "Reicha", verso die Adresse: "Kärnter Strasse No. 1106 im 2ten Stock beym Herrn Doctor Kolmann". - Der aus Prag gebürtige Reicha, langjähriger Flötist an der Bonner Hofkapelle und Freund Beethovens, lebte von 1802 bis 1808 in Wien, wo er als Komponist von Gelegenheitsmusik beachtlichen Erfolg genoss. Er nahm Unterricht bei Albrechtsberger und Salieri und übersiedelte anschließend nach Paris, wo er am Konservatorium u. a. Berlioz und Liszt unterrichtete. Am bekanntesten bleibt Reicha durch seine mehr als 20 zum Teil hochvirtuosen Bläserquintette. Seine Schriften zur Kompositionslehre waren sehr einflussreich und wurden in mehrere Sprachen übersetzt..
French composer (1770-1836), lifelong friend of Beethoven. Autograph letter signed. Paris. 8vo. 2 pp. Bifolium with integral address panel. 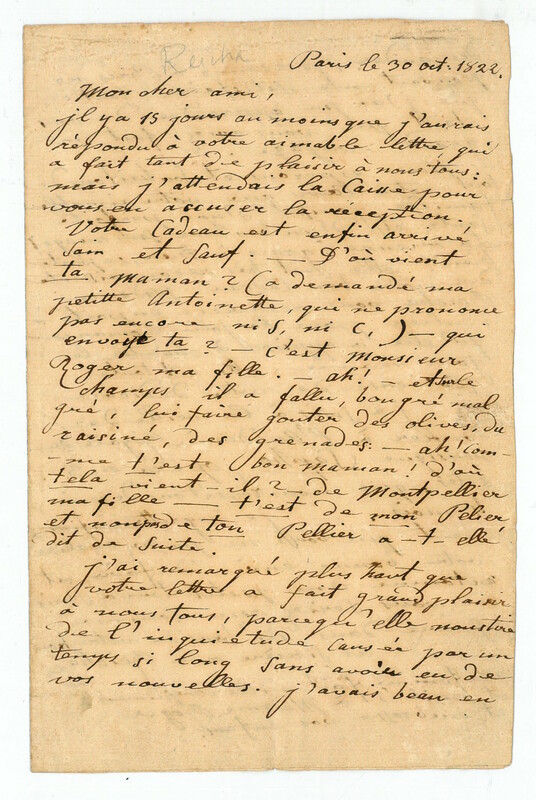 To Joseph-Pierre Roger in Montpellier, explaining that he has wished to answer his amicable letter for at least a fortnight but that he had wanted to wait for his gift to assure him of its reception and that it has finally arrived in perfect condition. Reicha continues by telling Roger how many questions his little daughter Antoinette asked about the gift and about Roger and how funny these questions sounded as Antoinette cannot yet pronounce the letters S or C. Reicha tells Roger that his letter has given great joy to all of his family as it finally ended the uncertainty of not having had any news from his side for such a long time. All the information that Reicha could get in Paris was that Roger had gone on a big journey. Reicha and his family hope and wish for Roger's family to be in perfect health and to enjoy "happiness without clouds". Reicha's family is fine and happy about Roger's gift. Madame Reicha particularly thanks him for the beautiful lovesong she learnt to sing the very day. She is all glorious about Roger's dedication. "Je suis à la veille de donner à l'Academie Royale de Musique Sapho, opéra en 3 actes, que nous répétons depuis 4 mois" ("I am on the eve of giving Sapho, opera in 3 acts, that we have been rehearsing for 4 months, at the Royal Academy of Music"). Reicha regrets very much that Roger will not be able to carry out his plan of taking a short trip to Paris that autumn where he would be received like a brother by his dear and sincere friend Reicha. 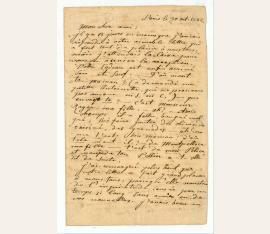 Reicha ends his letter by telling Roger that his wife sends a thousand compliments and greetings to Madame Roger and that she embraces their children..